MISSAL -Manuscript leaf from a missal,on vellum, written in black ink. MISSAL - Manuscript leaf from a missal,on vellum, written in black ink. 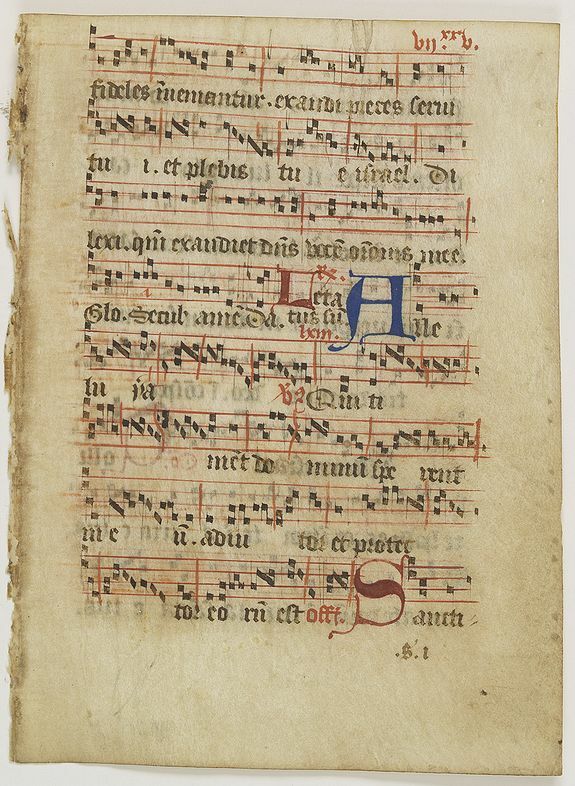 Title : Manuscript leaf from a missal,on vellum, written in black ink.. Date : France ca. 1480. Size : 5.7 x 4.3 inches. / 14.5 x 11.0 cm. Description : 8 lines of text under 4-line staves of music in red. RECTO: two 2-line initials in red and blue, on smaller in red, text in a refined hand, page is numbered XXV (25) in the right-hand top. Condition : Good condition,little wear, otherwise clean. The text is slightly shining through the vellum, good margins. Prickings for ruling the text lines still intact.